Download desktop picture of the day from different collections. Is there a better alternative to Pic-a-POD? Is Pic-a-POD really the best app in Desktop category? Will Pic-a-POD work good on macOS 10.13.4? Pic-a-POD has been a popular utility for many years, downloading pictures of the day from a selection of sites and allowing you to set your desktop wallpaper to a specific picture, or to a random picture that can be changed at a chosen interval. 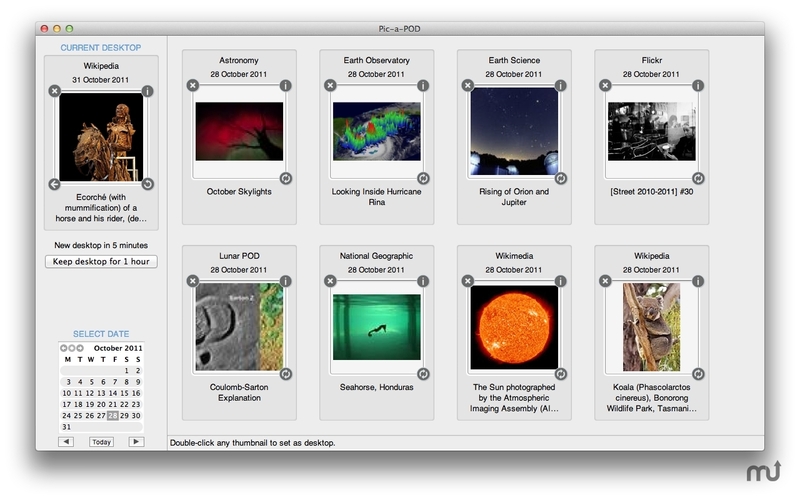 Pic-a-POD 2 is a complete re-write of this app and is now available in the Mac App Store. Pic-a-POD needs a rating. Be the first to rate this app and get the discussion started! Pic-a-POD allows access to 8 different POD sites and you can get the PODs for any date back to 1st January 2009. A picture browser allows easy access to all your downloaded PODs, while a detailed view shows a larger image and more text information. View the pic on its original Web site, or share the link using email, Facebook, Twitter or Google+. If you set Pic-a-POD to change to a random desktop at intervals, you can also set it to include a picture from your iPhoto library occasionally. Pic-a-POD also allows for multiple monitors and multiple workspaces in Mission Control.